420 started somewhere in San Rafael, CA in the late '70s. It started as the police code for Marijuana Smoking in Progress. After local heads heard of the police call, they started using the expression 420 when referring to herb -- 'Let's Go 420, dude!' After a while something magical started to happen. People began getting stoned at 4:20 am and/or pm. There's something fantastic about getting ripped at 4:20, when you know your brothers and sisters all over the country and even the planet are lighting up and tokin' up right along with you. Now there's something even grander than getting baked at 4:20. We're talking about the day of celebration, the real time to get high, the grand master of all holidays: 4/20, or April 20th. This is when you must get the day off work or school. We are going to meet at 4:20 on 4/20 for 420-ing in Marin County at the Bolinas Ridge sunset spot on Mt. Tamalpais. Just go to downtown Mill Valley, find a stoner and ask where Bolinas Ridge is. If you make it to Marin, you will definitely find it. I brought the flyer back with me and published it in the the May 1991 issue of High Times. For five years, no one questioned this explanation of 420. Then a few guys who went to San Rafael High School in the early-'70s stepped forward and claimed they were the ones who created the concept and coined the term. High Times declared them ("The Waldos") the inventors of 420. 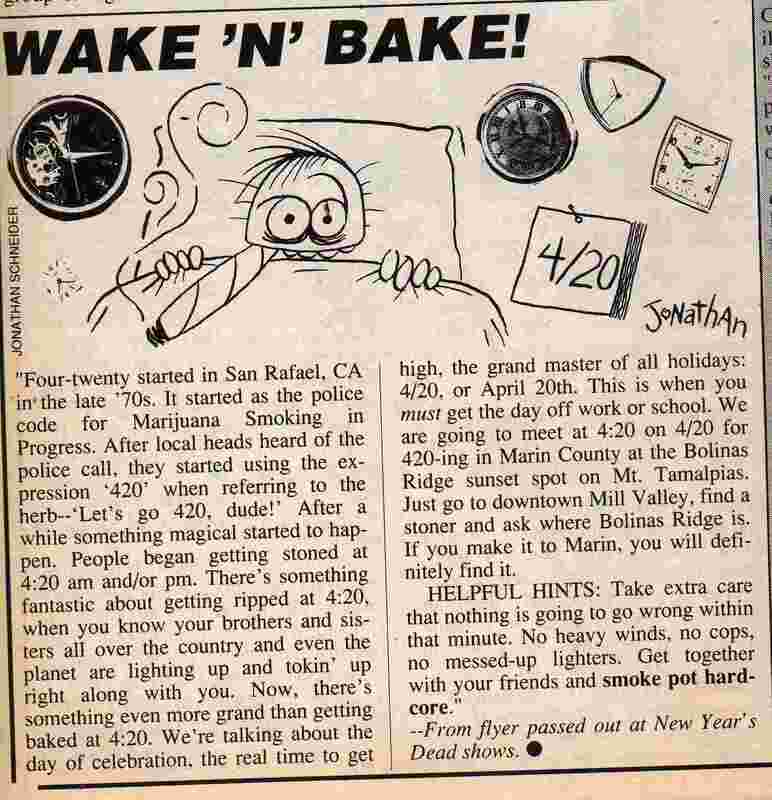 The flyer may have been erroneous about a police code with that number, but the authors of the marijuana missive had a bigger mission in mind: they wanted people all over the world to get together on one day each year and collectively smoke pot at the same time. They birthed the idea of a stoner holiday, which April 20 has become.